UND President Mark Kennedy told lawmakers, on Monday, that UND already has made a number of tough decisions on campus, with more to come, to meet mandated budget reductions. He said the University is “nearing the end of the road” as far as cutting, and that the state may have to look at allowing Universities the flexibility to increase tuition. UND Archives. BISMARCK —Tuition and what to do about it was a big part of discussion on Monday, when University of North Dakota leaders addressed a House Appropriations Committee at the State Capitol here. UND President Mark Kennedy led a presentation to lawmakers, largely echoing the message that he relayed to members of the State Senate in January: that UND, as the premier flagship University on the Northern Plains and North Dakota’s chief opportunity engine, is poised to (1) grow the talent needed to fuel the state’s workforce, (2)is a key driver in diversifying the state’s economy, and (3) will continue to leverage state dollars to draw in more in external funds from private-sector donations and federal research expenditures. But looming over Monday’s meeting was the specter of a new state revenue forecast that will be issued on Thursday (March 9). Many assume the news may not be good and that more budget cuts might be ordered for state agencies. Kennedy told lawmakers that UND already has made a number of tough decisions on campus, with more to come, to meet mandated budget reductions in line with the Senate appropriations bill. He said the University is “nearing the end of the road” as far as cutting, and that the state may have to look at allowing Universities the flexibility to increase tuition. 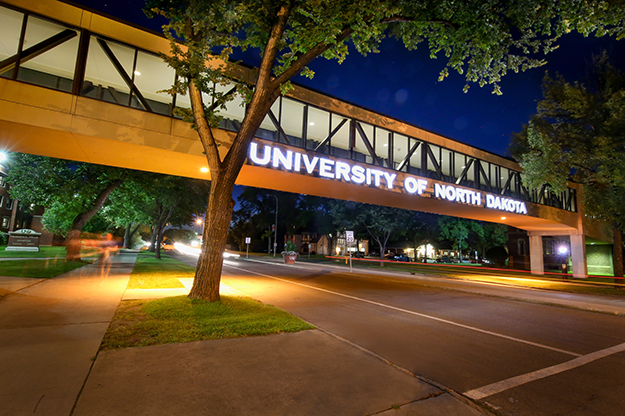 Kennedy pointed out that, for 2016-17, the University of North Dakota ($8,137) is charging far below the average in in-state tuition of regional competitors, such as the University of Minnesota-Duluth and the University of Minnesota-Twin Cities ($13,140 and $14,224, respectively). “So as we look at any adjustments that this upcoming revenue forecast may bring on, given the amount of cuts we’ve absorbed already, any further cuts I fear … would compromise the spirit of the enterprise and would have a long-term detrimental impact,” Kennedy said. “There’s far more room for tuition increases in the state of North Dakota than there is for further cuts,” he continued. Kennedy detailed for lawmakers some of the reductions that UND already has made, such as reducing the number of top executives and administrators and asking Colleges and support units on campus to cut their respective budgets by 12 percent. 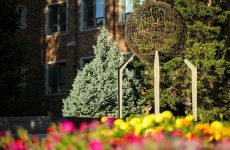 The UND School of Medicine & Health Sciences, which is treated as a separate line item on state ledgers, also has been asked to trim its budget by 10 percent, and UND Athletics is in the process of looking for nearly $1.3 million in cuts of its own. Those moves are on top of about $30 million in cuts that UND made in the last budget cycle, he said. 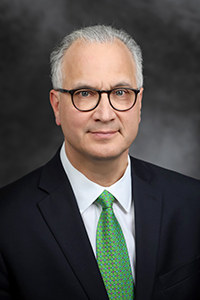 Furthermore, Kennedy told legislators that UND has imposed additional reshaping strategies to generate an additional $7 million annually ($14 million over the biennium) for strategic investments. These investments would help market the University to spur future growth and for research initiatives tied to “Grand Challenges” in the state in energy and sustainability, biomedicine, rural health and unmanned innovation. 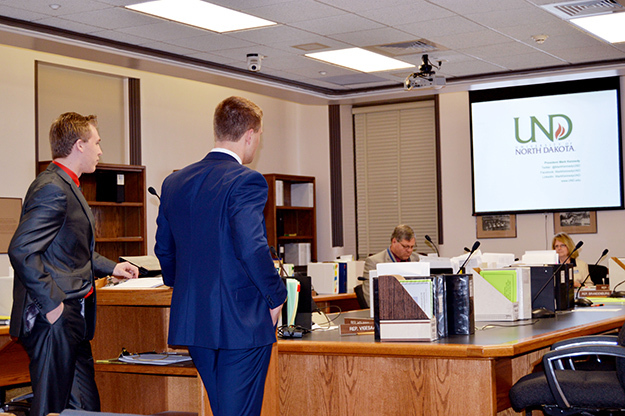 UND Student Government Legislative Affairs Officer Erik Hanson and Student Body President Brandon Beyer address members of the North Dakota House Appropriations Committee on Education and the Environment. Photo by David Dodds. Without saying it outright, Rep. Roscoe Streyle, R-Minot, vice chair of the committee, seemed to recognize that some kind of additional tuition flexibility might be in order, given the possibility of another bleak state revenue forecast on the horizon. Streyle quizzed UND student leaders at the committee hearing about where they stood on tuition increases. 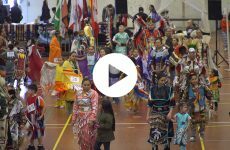 “Obviously, we’re going to have to cut these budgets dramatically by 20 percent or more … [and that’s] going to have an impact on students — it’s just that simple,” Streyle said. Brandon Beyer, UND Student Body President, fielded the question, demonstrating the tightrope he walks daily as an advocate for the University and the voice of its students. Beyer went on to say that UND student leaders understand the challenges and constraints that the University is going through, and that tuition increases are a means to offset the severity of cuts. 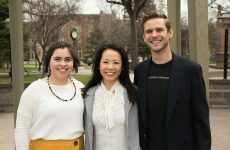 Still, he said, UND student leaders are advocating for a 3-percent cap on tuition increases, which the UND Student Senate will consider in a vote on Wednesday. “We feel there is value in a cap, especially in these tough times,” Beyer told the House panel. Beyer said, despite UND’s relative low cost nationally and even regionally, he still hears from students who want to keep costs down.